Fear originally was a very good thing. There’s a mountain falling down. Run! There’s a saber-tooth tiger coming your way. Run faster than the guy next to you! Unfortunately, over the centuries and millennia, fear has become something else. Fear is a tool. It’s a tool of control. The easiest way for someone to control you is to get you to fear something and tell you that they are the only one who can save you from it. Politicians use it. “If you vote for X, the world will be destroyed. You’d best vote for me because I can protect your interests.” Usually combined with a smarmy smile. In special relativity (I used to think the way people talked about it that it was called Spatial Relativity), Einstein found that mass is formed by kinetic energy divided by twice the speed of light. 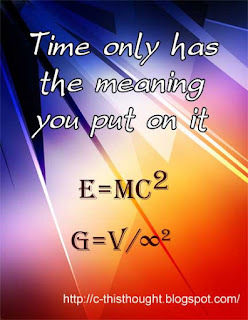 What Einstein may or may not have realized is this wasn't a formula just for science. It's the formula for life. So E=MC2 can be written as M=E/C2 = the mass is the end result of the energy expunged divided by the time required to create said energy.